2008-13 FLHT, FLHTC, FLHTCU, FLHTK, FLHX Magnum ABS Caliber 16" Handlebars w/Black Pearl Installation Kit. 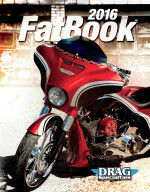 Bagger style for ABS Harley-Davidson® motorcycles. MAGNUM 1 1/4” Caliber handlebars are manufactured with the highest quality construction, including machined control mounts and feature high luster gloss black finish for an unsurpassed appearance. NOTE: Cable and line lengths are based on using 2” risers.